Remakes are supposed to be worse than the originals, right? Isn’t that the general rule of thumb that Hollywood has taught us? So how on earth did Hasbro’s new Combiner Wars Titan Class Devastator set actually turn out to be better than the original version many of us lusted over as kids? That’s easy; the two-foot tall Combiner Wars Titan Class Devastator is the largest Transformers set ever made. And thanks to modern manufacturing techniques, Hasbro didn’t have to skimp on the detailing this time around. There are so many tiny features and details on the six Constructicon toys that assemble to form Devastator you could spend weeks just simply admiring the giant figure from afar. But the new Devastator is also more articulated than the original version, and spending $150 on the set, just to leave it sitting on a shelf, feels like a travesty. Despite all of its magnificent detailing, the new Combiner Wars Titan Class Devastator is first and foremost a toy. And transforming it, and the six Constructicons, will certainly bring back some of the fondest memories you have from your childhood—even if you were never able to convince your parents to buy you the original. The star of this set is obviously the towering Devastator figure. It embodies the old saying, ‘the whole is greater than the sum of its parts,’ and that’s probably why Hasbro sells it fully assembled. The version we played with was actually the San Diego Comic-Con special edition featuring a handful of select parts upgraded with a shiny chrome finish courtesy of a vacuum metallizing pass. The box it comes in is massive, and a hinged panel on the front opens to reveal the assembled figure inside behind a full-length plastic window. Even collectors are going to have a hard time leaving Devastator in its unopened, mint condition packaging. What’s most surprising about the assembled Devastator figure is how articulated it is. The arms, hands, and legs can all be moved, rotated, and adjusted to create a variety of different poses. Many of the key joints that help keep Devastator standing also feature ratcheting mechanisms so they don’t give way under the weight of a two-foot tall figure, and the ‘clickety’ sound they make as they’re being adjusted is incredibly satisfying. Even Devastator’s hands have a decent amount of articulation. The fingers all move as a single unit, they’re not individually hinged, but it still allows Devastator to make fists, grab objects, and hold its humongous blaster. You don’t want to be an Autobot on the wrong end of that barrel. Devastator was actually the first Transformers toy—in North America at least—that did the whole combining trick. And while there were many that followed, Devastator was the only one to assemble from six similarly-sized vehicles. Later combiners used five vehicles instead, with one always being considerably larger than the rest since it was used to form the larger robot’s main torso. Even to a ten-year-old kid that approach seemed a little like cheating, and it in turn made Devastator feel all the more special. You’ll actually notice that same five vehicle approach with the other recent Combiner Wars sets too. However, the new Titan Class Devastator features all six of the original Constructicons assembled the same way they did with the original set—and that’s just awesome. Not surprisingly, even a two-foot tall toy robot made of plastic isn’t light. So Devastator’s feet, which might look a little flimsy, actually do a good job at supporting the fully-assembled figure—with the right pose. There were a handful of times when Devastator simply fell over when its balance wasn’t just right, but there’s enough articulation to ensure that it can often stand on its own two feet, with a heroic pose, for those rare moments when you’re not actually playing with it. As awesome as the new Devastator is, though, the best part of buying a Combiner Wars set is that you’re not just getting one robot toy, you’re actually getting seven in this case. And Hasbro didn’t skimp when it came to the redesigns of the six new Constructicons either. Long Haul, the dump truck, is the largest of the six Constructicons toys, and also the trickiest to transform. Most of the Constructicons could be transformed without having to reference an included step-by-step guide, you could just use photos of the robot and vehicle modes as reference. But Long Haul required a couple of peeks to figure out exactly how to get it from a dump truck to a Decepticon. Having to look at the instructions did feel like a little bit of a defeat, but accidentally breaking the toy would have felt even worse. So just how large are the new Constructicons toys? Here’s a couple of shots of Long Haul carrying an iPhone 5. Compared to the original Constructicons toys, the new versions are just as gigantic as the fully-assembled Devastator. Mixmaster, the cement truck, is the one Constructicon to really benefit from the SDCC special edition’s chrome upgrades. The actual mixing drum and the robot’s chest plates are extra shiny as a result, but that also means you need to be extra careful because the faux chrome finish can easily chip off, even with gentle play. You can’t ask a parent with more than one child to choose their favorite, and it’s equally unfair to ask someone to choose their preferred Constructicon. But were I forced to make a Sophie’s Choice decision, Bonecrusher, the bulldozer, would definitely get the nod. It isn’t the largest or most articulated of the crew, but it was the first Constructicon toy I owned. And I still love how the tank treads transform into a pair of legs and feet. I’m hesitant to describe any of the new Constructicons as disappointing. But Scavenger, the excavator, is kind of a let down in robot mode. As a vehicle it’s wonderfully detailed and includes an articulated digging arm, but its Decepticon mode feels a little on the flimsy side. When going into battle, you can probably expect to see Scavenger hanging back a little and letting the other Constructicons take the first blows. Given how detailed all the new Constructicons toys are, it’s actually a little disappointing that the crane arm on Hook can’t actually extend, or rotate left and right. There obviously have to be some sacrifices in functionality made given the multiple forms each of these Transformers can take, but Hook can’t even serve as a decent tow truck should one of the other Constructicons break down. It’s a good thing Devastator’s head is actually hidden inside Hook, otherwise it would have a hard time justifying its role alongside the other Constructicons during its yearly evaluation. Despite some limited articulation when in robot mode, Scrapper, the front-end loader, is easily one of the best-looking Constructicons toys in both of its modes. The giant scoop up front has enough movement to actually be used for scooping up dirt, the toy is dead easy to transform, and you get some lovely shiny chrome upgrades on its chest plating. There’s a good reason Scrapper was one of the favorites amongst my grade school friends, and it still has what it needs to be the most popular again. 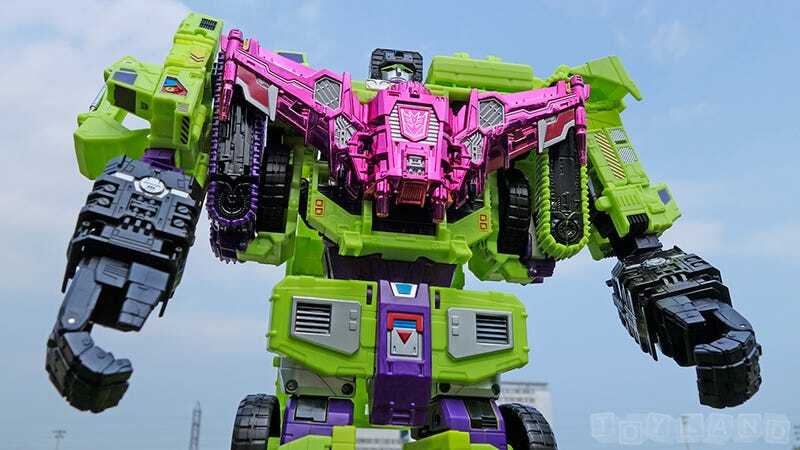 Ever since Takara Tomy and Hasbro started re-releasing Transformers figures many years ago (including the beautiful Masterpiece series) collectors have been wondering when Devastator would be next. It ended up taking quite a while for the Constructicons to return, but it was undoubtedly worth the wait. Is the set worth $150? That’s a hefty price tag compared to the original version, even when factoring in inflation. But the new Combiner Wars Titan Class Devastator is just so much better than the original ‘80s version that it’s simply not a fair comparison. When fully assembled Devastator will tower over your other Transformers toys, and that’s the way it should be. It’s a gigantic robot assembled from six equally-massive construction vehicles, after all! If we had to recommend a version, we’d probably suggest waiting for the standard set that will be hitting store shelves later this year. The San Diego Comic-Con special edition Devastator is certainly flashy with its shiny chrome accents, but you’ll probably be hesitant to ever take it out of the box given it will only be available in limited numbers. And if you don’t get a chance to actually hold, pose, and transform Devastator, you’ll simply be missing out on a wonderful bit of nostalgia. The ten-year-old version of you wouldn’t have hesitated to play with it, and neither should you.